Please write me if you need more information. PS After a successive check, I noticed that the "root" user (that I have enabled in my Ubuntu Xenial) can see the usb scanner (that requires XP drivers) but the TWAIN driver does not detect the scanner. VirtualBox show the USB scanner as attached. Hi, did you try to reboot? why do you have the guest-packages installed? I have tried to reboot. The problem exists using Win7 and WinXP. I think that it is independent from the OS. By using the Oracle VM Virtuallbox manager, if I click with the mouse over the setting of a configured or UNCOFIGURED virtual machine I do not see USB devices. With unconfigured I intend that I have created the VM but I have not installed the OS. Summarizing, if the VM Virtuallbox manager (in Italian Oracle VM Virtualbox Gestore) on a new VM machine (only created) does not see the USB devices it is not a problem of the OS. Using default Ubuntu Packages, I have installed the packages "VNC" and "Oracle VM VirtualBox Extension PAck". > Hi, did you try to reboot? > why do you have the guest-packages installed? the error is independent from the guest OS (see attachment). This is a from-scratch Ubuntu xenial installation. I have formatted the disk that contained Ubuntu 14.04 LTS. Ubuntu 14.04 executed VirtualBox perfeclty. Please write me to get more information to resolve the bug. mmm ok, so the same stuff worked on 14.04 but not on 16.04, and seems to affect only host, because with no guest installed you can't even see (some/all) devices. also, without checking virtual machines: open virtualbox, click settings, and tell me what is printed (screenshot is fine) on the usb section. the next step might be to download virtualbox from oracle website, and see if the issue is debian/ubuntu packaging specific or not. and the problem is still here! Sigh! On my home-computer (now I am using the work-computer) I have the same problem. I have enabled root password, I have copied virtualBox configuration in /root directory and I have verified that I can see the attached usb devices. After that I have tried to use an old USB A3 scanner that can be used only with WinXP. When I tried to use the scanner the OS XP answered me that the OS can not find the scanner (the scanner is available in the list of the Virtualbox connected USB devices ). I think that the problem is not in permission values, it could be a problem of the new kernel. no, the problem is in permissions. and let me know if it works. No changes, the chmod does not resolve the problem. As I wrote, I have run VirtualBox as "root". 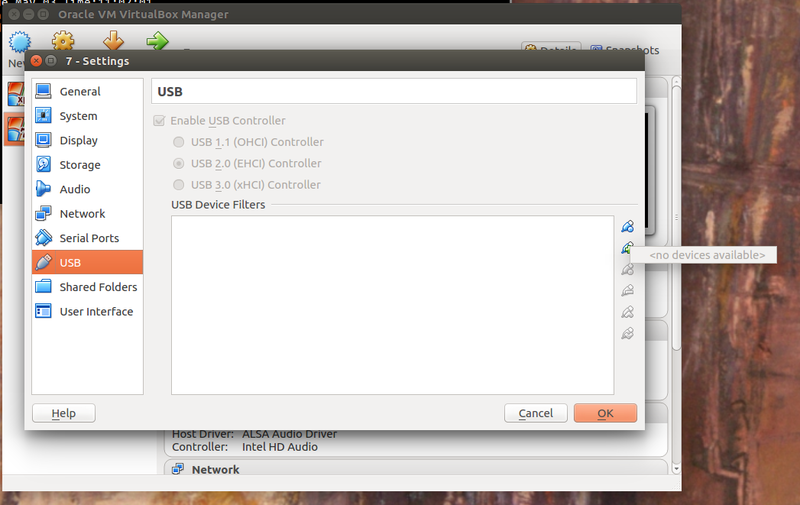 the root user can access to the USB devices but it can not use them. VurtualBox on Ubuntu16 runs correctly. After a dist-upgrade using "-proposed" the root can use the USB devices. I tried chmod 666 /dev/vboxdrvu and the user can not still use USB devices. can you please check if you have the same issue? requires XP drivers) but the TWAIN driver does not detect the scanner. VirtualBox show the USB scanner as attached. Hi, I think that the problem is a little bit different. After some tests perhaps it is a problem related to the permissions of the file. The problem is present before that the OS is executed. I attach a screenshot that shows the problem and VBox.log. 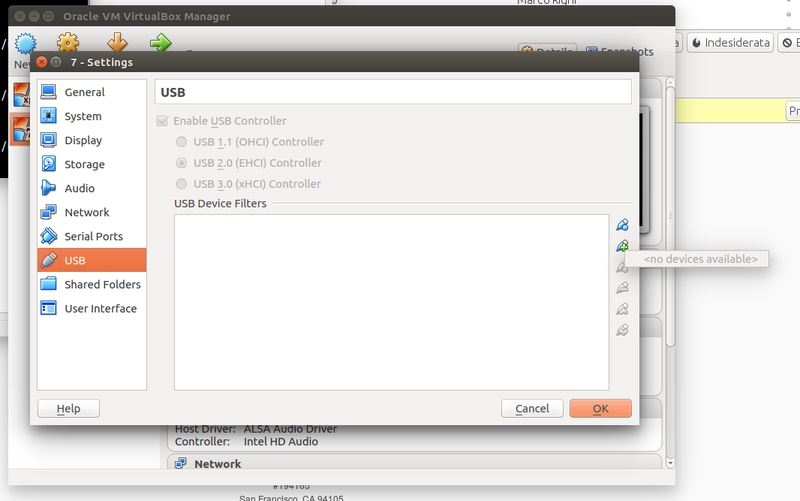 Even if the screenshot shows you that are not present attached devices, there are some USB attached devices! VirtualBox can not access to some /dev or something else and do not show the attached devices! Please write me ifd I can provide you more information, I really would like to resolve this problem! the VBox.log is attached here! and if it doesn't fix the issue, remove it and install the official deb file from here? I have no clues left. the test failed. VB 5.0.20 does not fix the bug. How many users have this bug? It should be a permission bug: some /dev files do not have dialout group. you are the first one having that bug. and BTW, "/dev" is usually populated by the kernel, so I'm really not sure about why you should have different configuration there. Description: USB 2.0 and USB 3.0 Host Controller, Host Webcam, VirtualBox RDP, PXE ROM, Disk Encryption. Ok, so the problem for me is the exhausting of inotify watches. Fixed by increasing the limits. I seem to be having the same issue here, at least symptom wise. No usb devices detected by the virtualbox host, but usb devices are properly detected by ubutnu. See Virtualbox log file attached and additional information below. My user is a member of the virtualbox group. ii virtualbox-ext-pack 5.2.18-1~ubuntu18.04.1 all extra capabilities for VirtualBox, downloader. Any advice or additional information to be provided? @kalbfuss please read all the messages, and if nothing fixes the issue, open a new one!